SERVPRO of Silver Spring North 301-593-5444...Here to help! A majority of fires that take place in homes begin in the kitchen. The holiday season is approaching, which means that many of us will be spending a lot more time in the kitchen. This also means that, with every pumpkin pie and each batch of Christmas cookies you make, there is a greater risk of a fire emergency. Aside from calling 9-1-1, which should be one of your first moves, here are some quick tips for dealing with a fire emergency in your kitchen. Test your smoke alarms and make sure they will work when you most need them! Keep these quick tips in mind, and prevent a major fire damage emergency from taking place in your home this season! Winter weather is coming...are you prepared for anything? Most of us would probably rather hibernate for the winter than deal with any of the home maintenance tasks that come along with owning property during the wintry months. We at SERVPRO of Silver Spring North would like to remind you that your winter will be much better if you take steps now to prevent any winter weather-related disasters or accidents happening in your home! Keep cabinet doors open during cold spells. This allows warm air to circulate around pipes that could freeze. Don't overlook these tips this year as you head into the winter months and holiday season. Keep your home safe and secure so that you can focus staying warm and cozy with your loved ones this winter! indoor air quality, keeping your ductwork clean should be a high priority. In most cases, the HVAC system has been operating for some time without much attention. Dirty ducts can circulate odors, contaminants such as mold and irritating dust throughout your building or home. These Contaminants from day to day living are sucked into your HVAC system and recirculated throughout your home over and over. This causes a buildup over time inside the ductwork. This buildup can result in poor indoor air quality that may cause health effects. SERVPRO is Faster To Any Size Disaster, and this quality provides many benefits for homeowners of waterlogged residences. When a pipe has burst apart, or a tub has overflowed, your home needs to have that excess water removed as quickly as possible. Homes in Rockville that have excess water from disasters such as pipe failures and forgotten tubs dry out best when water removal services from SERVPRO are the first part of the entire process. Pumping out any water that is visible upon our arrival helps us gain a better visual so we can more easily assess the extent of the overall damage. Larger amounts of porous materials require more aggressive drying methods than materials that are less porous. Our experience benefits homeowners in many different kinds of disasters that can damage a home by giving us insight into how best proceed in almost any type of situation imaginable, and overflowing toilets and tubs, exploding water heaters, burst pipes, and flooding from natural sources are only a few of those catastrophes. Removing water starts the process, but then we need to move toward removing the moisture that has escaped into the air through evaporation. This moisture can find its way into every part of your home and create problems later unless it is captured and removed. Dehumidifiers, heaters, air movers, and even open windows can work wonders when used together. Moisture meters provide us with a beginning readings of areas in your home that are compared to later readings, showing us our progress in drying out your home. When dry, remaining problems can still exist, such as unusual odors. This is because odors are caused by particles, that although tiny, produce smells when they have been disturbed. We can rectify this problem with odor control methods. Other problems that can remain behind include over-stretched carpeting, and we can fix that problem, also. Because floors are always saturated in a situation where standing water exists, we take great care in ensuring that these surfaces are completely dry. This prevents warping of wooden floors and sub-flooring. Otherwise, walking in your home may soon become hazardous for your family and guests. In situations that have left your home partially submerged, call us, SERVPRO of Rockville-Olney at 301-340-1313. We can begin water removal efforts so that your home is once again as it should be, perfectly dry. Accidents can occur at all hours of the day and night, and because of this, we are always available to take your call. Mold is often undetectable in homes until it has become a significant problem. Not every type of mold has that distinctive, ‘musty’ odor and if the growth started behind a wall or in the attic, the smell is not noticeable until the mold has grown into a large colony of spores. Restoring a home due to the effects of mold damage is a task that needs a professional service. SERVPRO keeps a trained crew on 24-hour notice to support our neighbors and customers. We have some of the best-trained personnel in the industry to clean mold from the property and safely remove it from each home. These technicians first determine the type of surface infested. This inspection decides both the cleaning methods needed and how much time may be required to complete the job. We usually divide surfaces into porous, nonporous, and semi-porous categories. Porous surfaces are typically building materials and fabrics; drywall and upholstery for example. They are often cleanable, but if the mold is very thick or has grown into the material, we dispose of it. Our cleaning methods for these surfaces involve vacuuming them with special HEPA filters that catch tiny amounts of loose mold, even a single spore. After finishing vacuuming, we move on to using spray bottles with an antimicrobial cleaner and foaming agents to dampen the surface. Wetting loosens the mold and allows technicians to remove it with cloths and sponges. Nonporous surfaces are the easiest to clean. This category includes metal and glass tabletops as well as marble and smooth stone kitchen countertops. In many cases, we can remove the mold with dry cloths and sponges. Technicians wipe down the surfaces from top to bottom to prevent accidentally leaving spores at the top or along the sides. If the mold layer is thick, we vacuum it first before dry wiping. Semi-porous surfaces (concrete and wood decks for example) require methods not acceptable on other surfaces. Affected surfaces may need sanding to wire brushing and other abrasive tools to dig out the mold. The cleaners we use on these surfaces would mar or otherwise destroy glass and metal surfaces. If mold has penetrated the surface of the wood or concrete, technicians may have to sand them down by hand or with a power sander to remove it. Returning your home to its pre-mold condition is not a quick or easy set of processes. SERVPRO of Silver Spring North has years of experience in helping our customers through each step to put you back into your home. If you need us, call (301) 593-5444 today to set up an inspection. When a flood or any other water events like supply line break or pipe break destroys your home, it's necessary for you to act quickly by getting professional flood restoration services. Cleaning up water damage involves more than just drying and wiping the residue away. Additionally, delaying makes the damage worse because the water will seep into the walls, furnishings, floors, and this may result in mildew and mold growth. Water mitigation can be devastating, but when one gets professional services, restoring the home becomes easier and you can put the traumatic event behind. Water/flood damage is the destructive process which occurs when water gets into a building. This can be caused by a pipe break, supply line break, or floods after it has rained heavily. Water in a home or water in a business can cause damage like oxidation of metal (rust), rotting wood, composite building materials delamination, and microbial growth. Immediately water seeps into the building materials, a chemical reaction begins to occur hence breaking down the strength of the material. In case water cleanup and drying aren't done immediately, the stability of the structure can be compromised. This makes the flooded home unsafe for human occupancy. Sometimes the effect just comes from a simple pipe break. The first step for handling flood damage when you have a flooded home is emergency mitigation. This involves locating the cause of the problem (be it a pipe leak or a supply line break) and eliminating the problem. The next step in managing water in home or water in business damage would be assessing the water damage and any dangers to humans. All these services are to be handled by licensed and trained water cleanup professionals. What follows is the drying and dehumidifying all the affected areas. After the restoration company team assess the documents, equipment as well as other items to know if the contents can be restored or not. Mold mitigation services also come in handy as they help with getting rid of any microbial growth associated with a flooded home. Once the structure is safe for occupation, your family or employees can get back to their normal operations. Tackling the task of restoring your flooded home or business after flood damage can be slow and exhausting. This increase the probability of further damage especially when the cause of the problem, like supply line break or pipe break, hasn't been addressed. By working with a reliable restoration company, water damage mitigation becomes manageable. The water cleanup and drying process is handled efficiently and quickly by flood damage professionals. In case you have experienced mildew or mold after water in home or water in business, you know how hard it is to get rid of the problem. Prompt water and flood damage restoration can reduce the chances of mold growth. When you have water or flood damage coverage in, the mitigation firm will assist you to deal with the needed procedures and forms. The restoration company helps its clients to document the losses they suffered so that they can get the proper settlement from the insurance company. With the water cleanup company, you will get a list of the needed repairs and proof of damages in case the insurance company decides to dispute the claim. In case you have suffered water in home or water in business damage, consider contacting a restoration company immediately to prevent further damage. Although hiring experts will cost you to get restoration services, the expenses can't compare to the costs you'll incur if you do nothing or decide to handle the restoration all by yourself. With winter approaching, there are several steps that can be taken to ensure your home is ready to withstand the cold temperatures. Most steps that are taken are inexpensive, and take little time, but can help avoid property damage. 1). Seal off drafty windows and patio doors with clear plastic. 2). Insulate the hot water lines around your hot water heater and turn down the temperature to the "warm" setting. 3). Replace your furnace filter. 4). Use a programmable thermostat to reduce heating costs when no one is at home. 5). Keep all vents and baseboard heaters clean. 6). Install foam insulators behind the face plates of light switches and electrical outlets. 7). Remove any window unit air conditioners. 8). Close off rooms that aren't used and shut the vents. Exposure to biological and chemical contaminants can pose serious health consequences. A failure to properly remove such substances can contribute to unhealthy and dangerous environments. SERVPRO of Silver Spring North has highly trained technicians that can safely clean and remove biohazardous substances and dispose of them properly in accordance with OSHA and health regulations. The decontamination process of a home or business due to trauma, sewage backups, chemical spills, hoarding or other biohazards can be both dangerous and emotional. SERVPRO of Silver Spring North can provide cleanup and recovery services for many biohazardous situations including but not limited to: sewage backups, crime scene residues, suicide/death accidents, blood cleanup, hoarding scenes, and animal waste/remains. Biohazard emergencies don't always happen during the regular work week. That's why SERVPRO of Silver Spring North is available 24 hours a day, 365 days a year for your call. You can expect an immediate response time, day or night. The Institute of Inspection, Cleaning and Restoration Certification (IICRC) is recognized internationally as a knowledgeable industry voice and resource. It serves as an independent, nonprofit standard-setting and certification body, to set and promote high standards of ethics; and to advance communication and technical proficiency within the inspection, cleaning and restoration service industries. 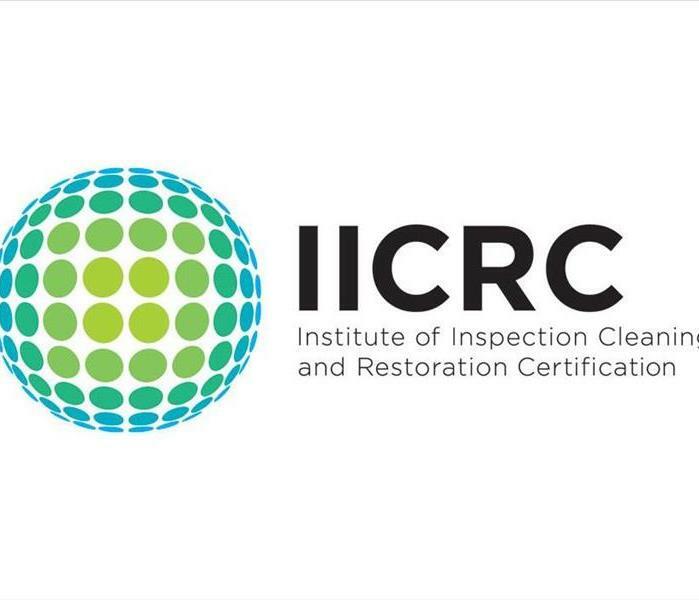 The IICRC offers certifications in several categories of Cleaning, Inspection and Restoration. As well, there are Journeyman certifications available to those individuals advanced levels of recognition which are achieved by having several certifications in select categories and a minimum of three to five years of experience in the cleaning/restoration industry. Here at SERVPRO of Silver Spring North our technicians are IICRC certified and continue their education and certification throughout their employment. As new certifications become available through the IICRC, steps are taken to ensure that our technicians are certified in the latest techniques and services. 2/8/2018 - What is a flood cut? 11/17/2017 - What is the IICRC?